Japan Update #14 - Over Hill, Over Dale, Big Hills make tired tails! When last I wrote I said we were just going to do some easy riding that day, Saturday, since we had plans for a tough ride on Sunday. I think I lied. From work, we decided to ride to Kakegawa to pay our parking ticket. Of course, being genki (strong) we took the real hill route up past the reservoir and through the tunnels. It was really nice as the weather was good and there was virtually no traffic. A few months ago we would have had to think hard about going up this hill, now we do it on an easy day? Kyoku-ni gaijin (crazy foreigners). We got a ticket a few months back when we left the Santana in a bicycle parking area while we went shopping. We did not realize that people rent the spots on a monthly basis. When we got back to the bike there was a note attached to it. At work we asked what it was and we were informed that we had not paid to park in that area and that we owed money. Well, Saturday we tried to pay up. We brought the note, presented it to the attendant and asked how much it cost. He tried to tell us something (not the cost) which we did not understand, then looked out at our tandem leaning against the bushes. He asked if that was what we were riding when we got the ticket. We said yes, and he said we did not have to pay. 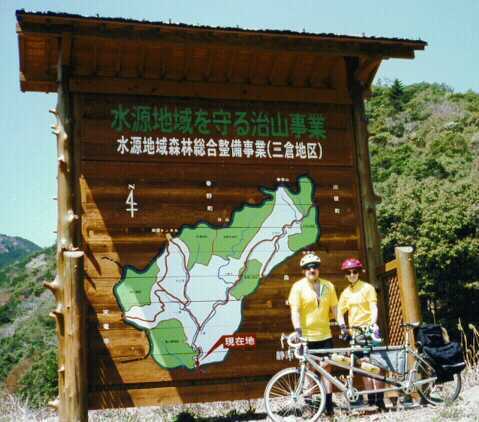 I don't know if it was the tandem or the fact that we were gaijin (foreigners), but we liked the outcome. So we got our usual ice cream for lunch (yes we are in a rut) and then rode back to our town following the Shinkansen (bullet train) line. This was the flattest route we had ever taken between the two areas. It wasn't as scenic as following the rivers, but there were fewer stops and turns. Stopped at the supermarket for dinner fixings and headed home. At the market, they have a long section for bike parking, but somehow our little bike always sticks out. It just doesn't seem to fit in the nice neat line of all the other bikes. It feels ostracized! The next morning Lindy told me she had dreams of running a marathon and of only being able to run 3 steps, then walk 3 steps, and then her legs would cramp up. The cramps were real and she said the legs felt really tired. But we figured, "onward and upward". We had plans for a ride and the weather was cooperative. We loaded the bike onto the car, packed a few bagels (homemade of course), granola bars, and energy drink. We drove north about 10 kilometers to get to the other side of Fukuroi and past its' densely populated area. Found a place to park and started the ride. 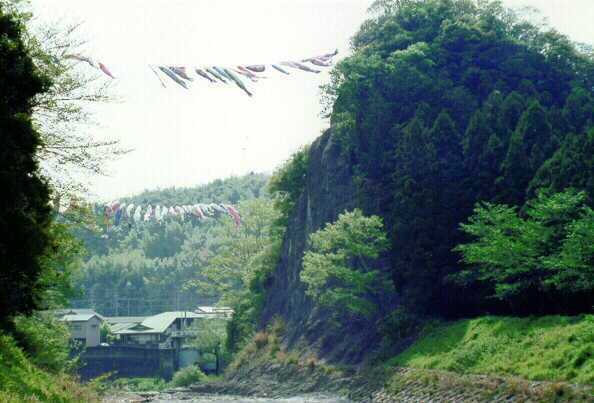 The first 8.5-km was up to Mori-Machi, where we had gone to the big Matsuri (festival) last fall. This was good since we knew where there were bathrooms there, and we did not know if we would find any more for a long time. This was a gradual grade so we felt reasonably good in this section. 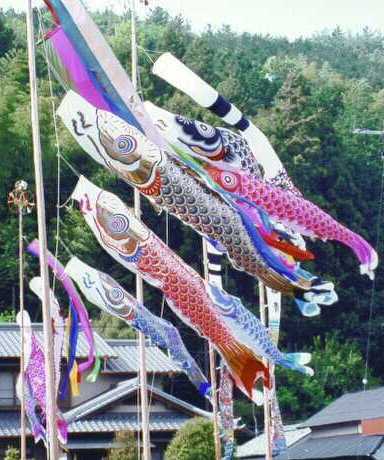 There were many "carp" windsocks flying at different houses along the way. The traditional flying of these windsocks is to celebrate male children for the month prior to children's day, a national holiday. Traditionally there would be 3 or 4 of these "carp" flying, but many of the houses had 10-15 of them blowing in the wind. Fantastic, as they are quite colorful and as long as 4 meters. After Mori, we kept going north up the river (no without a paddle jokes please) and the climb started to get a little steeper. There was more traffic than I had expected since there really are not very many people living up in these hills. At about 18 km we stopped for another pit stop. We have now learned that many of the bus stops will have a "porto-potty". At this town we would be leaving the "main" road, and the bus route and starting the real climb sections. We ate our bagels and some locals came over to talk to us. 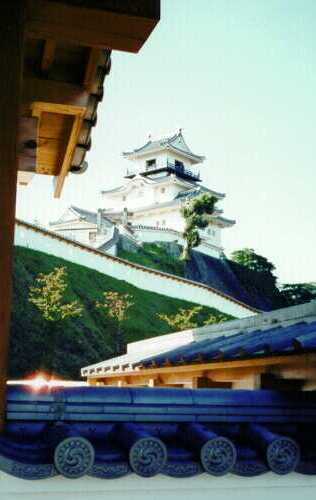 They spoke about as much Ei-go as we spoke Nihon-go, so we were able to communicate somewhat. They thought we were riding a henna jitensha (strange bike). They worked for Yamaha and rode motorcycles. Well, let the climb begin! We were now in mountain territory. Very sharply rising hills out of the valleys. We were leaving the river and going over the mountains to get to the river we would follow south to go back home. Mountains. They were beautiful, but I guess we are somewhat masochistic. The views from the tops of the climbs, and from the switchbacks were of magnificent peaceful valleys. We stopped a couple of times just to take in the scenery; we really did not need the rest break. Not! During the first of the three wicked climbs I heard the rustling of the map in Lindy's hand and made the mistake of asking her if she was sitting up. Indirect communication of saying, "work harder!". Fortunately she is a very forgiving stoker, and said she was not sitting up, but hadn't put the map away since she did not want to let up on the pedaling. I guess it was her fault for violating the agreement we have that I will get us up the hills and she will get us down. At the top of this hill I apologized and explained that I was dying, and she said she thought I was dying. But we made it without stopping. We have one of the Cateye computers with altimeter so we kept track of the climb. It was 1.25 miles of 10% grade. We had never climbed that type of grade for more than a few hundred meters previously. Now I know why. It's too much like work! The ride down the other side of this "hill" was really nice since we were not working too hard to look at the views. The only downside (no pun intended) was that the hill was so steep, with so many switchbacks, that we went down with the drum brake on the whole way, with a little help from the rim brakes. It does not seem fair, to work so hard going up, and to not get to fully enjoy a free ride down. Oh well, hills happen. Of course, that was just the first of the hills. The next one was more of the same, just a tad shorter and a tad steeper. The same amount of climb but we did not have to go as far for it! It was one mile and 11-12%. The switch backs themselves were really one of the toughest sections. The turns were steeper than the "straight" sections and we had to make hard turns at very low speeds. We did these sections at 6 - 6.5 kph (about 4 mph). I really like the 20x32 gear. Can I go to 16x32? I don't think so but at times like this it would be nice. Again, the views into the valleys made the work worthwhile. 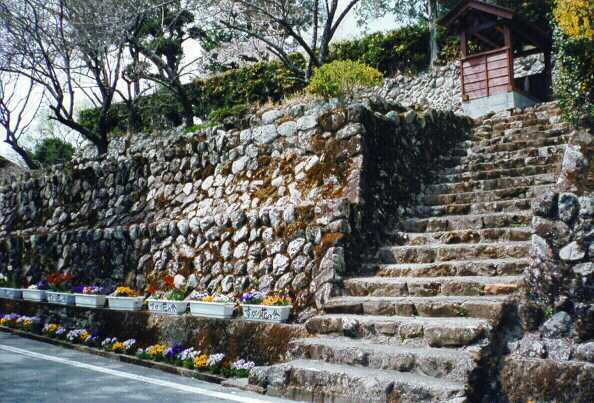 Up in the hills, the Sakura (cherry blossoms) were still in full bloom. They are striking when framed by stands of cedar trees and tea bushes. 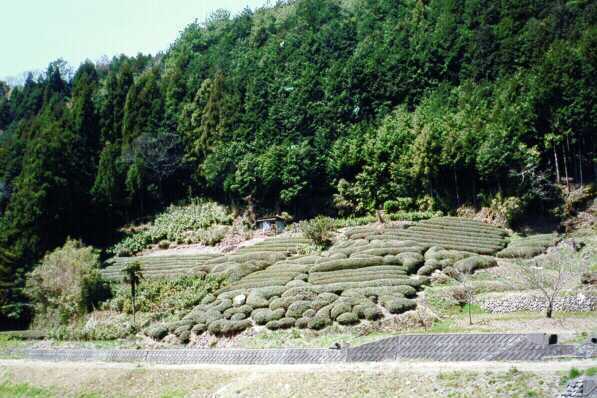 Yes, even in these hills farmers are growing tea. We also noticed a lot of wood stacked for drying. It was cut into one-meter lengths, and the logs were standing up leaning against rails. We don't know what the wood is used for. Maybe firewood? It is all cedar. BTW, 60% of the wood crop in Japan is cedar. The smell of the fresh cedar is wonderful while riding through these forests. It is really fragrant and intense. As we went up this hill, about 2/3 of the way up, I heard Lindy wheezing behind me. I suggest that she should not die and to back off a little. It worked as she started to breathe somewhat normally after that. Her slight backing off decreased our speed from 6.2 to 5.9 kph. I ignored tandem rule #7 (do not make the stoker laugh while going up a tough hill) and tried to make Lindy laugh. No luck. I guess that rule may not really matter! These were definitely hills. Afterwards she commented that she thought I was dying so she was putting out the extra effort to keep us going. We decided that it is best to blow-up together, since if one blows up the other will surely follow in a very brief time. Down the other side of the hill, same problem, couldn't let it run due to the terrain. BTW, I did not mention that this two-way road was barely wide enough for a car to pass us. Without the occasional wider sections (put in for this purpose) two cars would not be able to pass by each other. Combine this narrow road with sharp switchbacks and you begin to understand why speed must be controlled. I have become adept at looking up at the convex mirrors while going into the turn to see if it is clear. About 2/3 of the way down we picked up the river. It reminded us of the river gorges in the Finger Lakes. Wooded slopes with short shear drops into the shallow river. It also started to get cool and we stopped so Lindy could put on a windbreaker. We had brought tights and arm warmers as well since we did not know how much cooler the mountains would be. We followed this river for a looong time. We would occasionally look at the map to try and figure out where we were, but with no cross roads it was almost impossible. All we knew was that we were on the right road and that we had not missed our turn, yet. We did almost miss it. It was a hard left onto an unmarked road that looked like hardly anybody used it. At the corner was a temple, which was our clue since it was marked on the map. 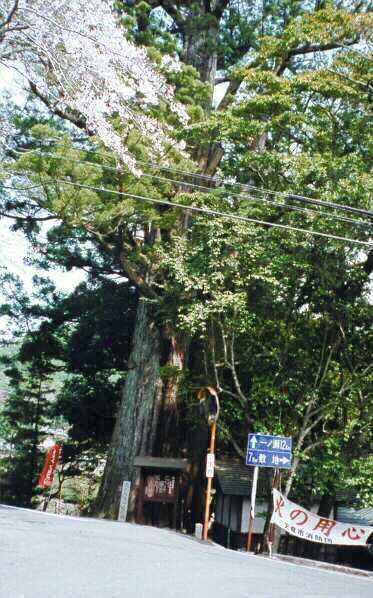 This corner also had the biggest tree we have seen in Japan. The diameter at the base was about 3 meters, and it was tall. It was very impressive standing there dwarfing the cherry trees around it. Turned that corner and headed into the last of the climbs. This one turned out to be only one kilometer long, but the same 10-11% grade. It actually seemed easy since we were mentally prepared for a longer climb. Then down, down, down. At least here we were into more open country and could let the bike fly for a while. It was nice to be able to go 50 kph, even if only for a short time. Back in civilization, people and some cars again. The views changed from steep mountainsides to shallow valleys. We could actually see where we were going, no more blind corners. We were also getting quite tired and we both needed a pit stop. Then there it was, on the side of the road, for no apparent reason, a porto-john. Not only that, it was a flush type, and came with its' own toilet paper. Oh wonders! After a long (actually not that long) tough ride you learn to appreciate the simple things. The wind picked up as we entered the last few km of the ride. Lindy was definitely past being energetic and I was on my second wind (pun intended). There was some debate about where we needed to turn, but the less tired mind prevailed and we were OK. One more bridge to cross and the car was in sight. A wonderful sight at the end of a glorious ride. I don't quite know how to describe it, but the beauty of the scenery is enough to make us willing to do this ride again. However, prior to that, we will do an extended, but less hilly version. At least that is what I am proposing. We can bike further north up the river and go around those very steep sections. Problem is, it adds about 20-25 km to the ride. We are also trying to plan where we want to ride during "Golden Week". That is a national holiday week starting in 1 1/2 weeks. Unfortunately, the best places to go see will be mobbed, so we are going to go counter-current and go where the locals are not going. 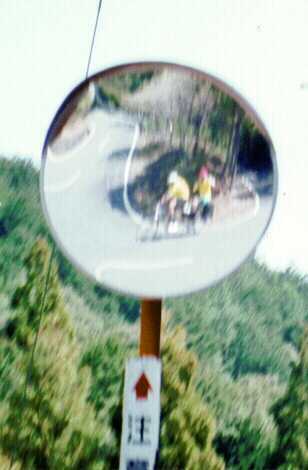 The Japanese roads are not made for heavy traffic, especially not when combined with cycling on a tandem. Going up some of the rivers, possibly staying overnight in some of the local inns (read B&B as F&F: futon and fish) are some of the possibilities.